there are many different type of fasting systems for Ipe Decking. This page discusses Face Screws where we drill and screw down from the top of the board. Brazilian Hardwoods like Ipe, Cumaru and others are so dense and hard that you cannot just screw through them like you can PT. If you have used PT in the past, you may be at a disadvantage. Any time you need to put a screw through Ipe you will have to pre-drill. Below highlight the various ways to do this as there are a lot of tools to help you save time. Face screwing is very straight forward and anyone can do it. Face screwing has the best holding power as there are two screws per joist. Face screws are just as their name implies. You drill and screw down through the face of the deck board. There are various types but you should always use Stainless Steel. There are various Hidden Systems on the market. We overview these at the Hidden Fastener How To. In addition, there are a hybrid type system where you drill, then countersink a big hole and plug it with an ipe plug. This has the benefits of face screwing but the look of hidden fasteners. Drill and Plug installation: Drilling and plugging sounds easy. Just be aware you need to drill a counter sunk hole. Then you need to clean the debris from the hole. The tools below can do all of this in one pass. Then you do need to place glue into the hole and insert the plug. Frequently the plug is a little higher than the surrounding deck board so you will need to use a chisel to insure the the plug is flush. Finally, a quick pass with a sander to finish and remove splinters. There is time needed to do all of these steps. Be aware that the labor for installing Ipe Decking is more than PT. As you have to pre-drill every hold you can quickly see that there is a lot more labor. Assuming two (2) holes per joist. Installing Ipe 1×6 on a 100 sq ft deck with 16 inch centers will take a minimum of 330 holes. If you assume an average of 20 seconds a hole (this is fast) then you have a labor component of 2 hours. That is just to drill the holes not screw the wood down. You can see that this will add a 14 hours labor to an average 700 sq ft deck. You need to be aware of this when either planning the job yourself or bidding the job out. Starborn makes the Smart-Bit, a nice all in one tool that will both drill a hole and countersink the hole to to the proper depth for their Headcote screws. As this is all in one motion it saves a lot of time. 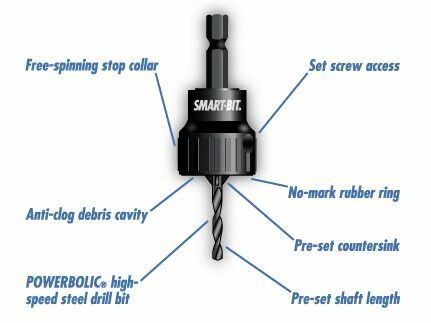 The Smart-Bit drills and countersinks for the Headcote screws. They (nor we) make any claim for it to countersink for any other screws. Do not assume you can buy a Smart-Bit and it will work for other screws. It may but it may not. The Headcote screws come in a variety of colors. However brown “ipe like” is the 95%+ seller for us. that color works with Ipe, Tigerwood, Cumaru and compliments Garapa. Remember that your deck will constantly weather and change color. Your screws will compliment the deck but will never match it. Ipe Clip has developed a new system with their Drill & Drive. This is an entire package that includes a quick release collar, drill bits with 3/8″ countersinks, drill bits with 5/16″ countersinks, driver bits and more. The Drill & Drive works with both face screws to drill and countersink and to drill and countersink for plugs. Colored Screws from DeckWise (Ipe Clip). Ipe Clip through their DeckWise division carry colored Stainless Steel screws in Black, Brown, and of course Stainless. The colors are color fast and will stay for a long time. In addition, Deckwise Ipe Clip carries both regular and Extreme plugs. Between the Drill& Drive, the screws, and the plugs you can either have a face screw look or a screw and plug “hidden” look. The pro-plug is an entire system that drills a hole and countersinks for a plug. Their system is designed for everything to work together and as such, comes as a kit. The glue nozzle is designed so that the glue is placed on the perimeter of the hole and not on the bottom. This system we have heard nothing but compliments.